This catamaran sailing and snorkeling tour will give you the best time out of your trip to Cabo San Lucas. It really does sum up the word paradise. Imagine sailing on a beautiful morning on board a catamaran to one of the premier snorkeling destinations in Cabo San Lucas. Here you will see the lazy sea lions basking in the sun, enjoy snorkeling with colorful tropical fish and more. The snorkeling tour begins with a boat ride out to beautiful Santa Maria Cove. The water in this area is teeming with marine life and tropical fish. You might see sea turtles or manta rays, along with hundreds of tropical fish. Lunch is served on board and of course the all-you-can-drink open bar will have plenty of free flowing cocktails and beers. 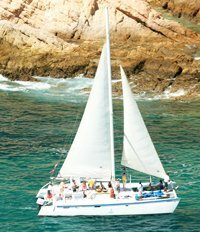 This is truly one of the most enjoyable excursions in Los Cabos! Twice Daily at 10:00 AM (all year) and 12:00 PM (from April to November). Exact start time may vary depending on logistics of the day but will be shown on your ticket. The Marina in Cabo San Lucas (walking distance from the cruise pier). Exact meeting directions will accompany your confirmation. Money for Photos, Fees, etc.